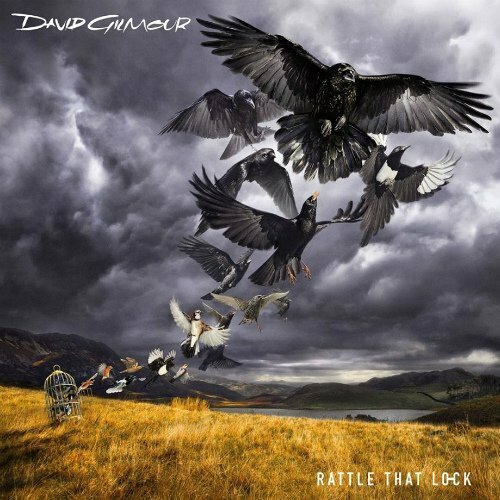 Today, David Gilmour has released his fourth solo studio album, Rattle That Lock, via Columbia. The LP features 10 tracks, and the deluxe version includes four alternate versions of songs. It was recorded in three locations: Medina Studio, Astoria Studio, and AIR Studios in England. Gilmour and Phil Manzanera co-produced the album. Gilmour's wife, Polly Samson, is given lyrical credit for five songs: "Rattle That Lock," "A Boat Lies Waiting," "In Any Tongue," "The Girl in the Yellow Dress," and "Today." Three instrumental tracks ("5 A.M.," "Beauty," "And Then...") and two Gilmour tracks ("Faces of Stone," "Dancing Right in Front of Me") round out the album. David's son, Gabriel, makes his recording debut on "In Any Tongue," playing piano. Other special guests include David Crosby, Graham Nash, and Jools Holland. The artwork for Rattle That Lock was created by Dave Stansbie and Aubrey Powell. Mr. Powell co-founded the cover design company Hipgnosis with Storm Thorgerson in 1967, and has worked with the likes of Pink Floyd, Led Zeppelin, and Paul McCartney. Pick up Rattle That Lock on Amazon (Vinyl, CD, MP3). You can also stream the full album above, via Spotify. Gilmour has been slowly announcing concert dates for 2015-2016 in support of the new album. For more information on that, as well as his latest music and news, check out his Zumic artist page.